The North Yorkshire Moors is a beautiful place to stay and visit. Starting with the gateway to the moors is the district of Ryedale, with its pretty market town of Pickering, a busy little town developed around the important crossroads where the Malton to Whitby and the Thirsk to Scarborough roads intersect. Pickering is a market town and possibly the oldest, claiming to date from 270BC. Helmsley & Kirbymoorside are also market towns. There is plenty of bed and breakfast accommodation, self catering accommodation & guest houses around the Pickering area. Ruined abbeys and castles, great houses and gardens are framed by high moors, wooded hills and lush farming country. 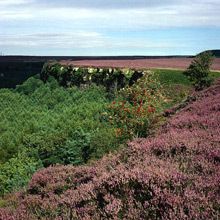 The North York Moors protects more than 1000 square miles of wonderful walking country. The Cleveland Way National Trail meanders through 110 miles of the spectacular Moors and Coastal landscape and through thousands of years of history. The North Yorkshire Moors National Park is the largest expanse of heather moorland in the UK, with its many varied, un spoilt areas for you to walk or cycle in, or just to admire the fantastic views. The moors reach over to the sweeping and dramatic cliffs of the Yorkshire coastline with its many bays, beaches and of course bird watching at Bempton Cliffs (RSPB nature reserve) and Flamborough Head. Nothing beats the timeless appeal of the seaside with its golden beaches, majestic cliffs and great British resorts with the beautiful and varied coast line of Staithes, Sandsend, Whitby a historic port, Robin Hoods Bay, Ravenscar, Scarborough & Bridlington bustling with life & Filey, are all within easy reach and all are traditional favourites. Walk along the sea front at Whitby, see the famous fish shops, walk along Whitby harbour and into the old town and take the 199 steps up to Whitby Abbey and see the fabulous views across the bay, look out to sea and over the town of Whitby from Captain Cook's Monument. The Old fishing villages of Robin Hood's Bay, Staithes and Runswick Bay with the quaint old fishermen's houses are popular places to visit. 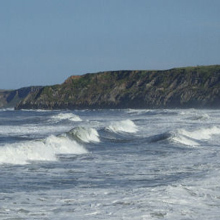 Scarborough has the popular beaches North & South Bay , having the usual entertainment for families and a thriving town centre, not forgetting, Scarborough's Sea Life Centre and Scarborough Castle. There are English Heritage sites such as the castles, Pickering Castle , Scarborough Castle & Helmsley Castle, in its busy, pretty moors-edge market town. Close by – indeed within walking distance via the Cleveland way – are the vastly impressive ruins of Rievaulx Abbey. 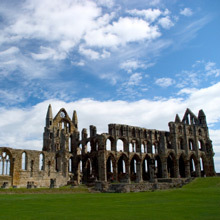 Its tranquil and beautiful setting makes this arguably the most atmospheric and complete of all the great northern monasteries, Byland Abbey and Whitby Abbey are further impressive English Heritage sites to visit. 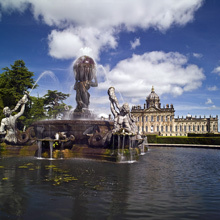 National Trust Properties offer beautiful places to visit; Rievaulx Terrace and Temples, Nunnington Hall, Mount Grace Priory, Fountains Abbey and Studley Royal Water Garden, Beningbrough Hall & Gardens. There are many gardens for you to visit, Scampston walled garden, Helmsley walled garden, Duncombe Park, Words Way Lavender, Yorkshire Lavender and not forgetting the large gardens of Castle Howard. 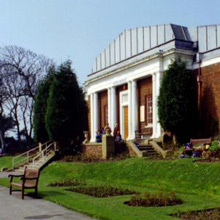 The museums of Eden Camp - (between Pickering & Malton), Ryedale Folk Museum at Hutton le Hole, Beck Isle Museum at Pickering, York Museums, The National Railway & Castle Museum and Captain Cooks Museum at Whitby are all popular places to visit. There is the famous television series of Heartbeat filmed in North Yorkshire and on the North Yorkshire Moors Steam Railway , The village of Goathland is known to many as the village of Aidensfield in the TV series of Heartbeat. 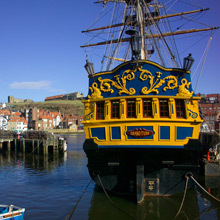 Also "The Royal" television series is filmed on the moors, Whitby, Scarborough and the surrounding area. Thirsk has become well-known for it being the famous home of the veterinary surgeon Alf Wright, better known as James Herriot, author of the books of All Creatures Great and Small. In his very popular books Thirsk is clearly recognisable as Darrowby; The World of James Herriot is housed in the original surgery and offers an excellent Museum. There are many small and quaint villages in and around the area, Hutton le Hole, Rosedale Abbey, Lastingham, Thornton le Dale, to name but a few. The North Yorkshire Moors Steam Railway runs through the largest dale in the North Yorkshire Moors, Newton Dale. The Steam Train runs between Pickering & Grosmont, calling at Levisham station & Goathland (Aidensfield in Heartbeat). 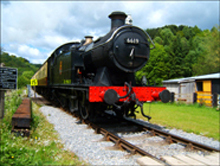 It is an 18 mile journey along one of the oldest and most dramatic scenic railways in the country. York is also close to the north Yorkshire Moors. York – home of the iconic Clifford's Tower and the unusual 1960's Cold War Bunker, with the Castle museum, Jorvick Centre, National Railway Museum and its walled battlements. York minster and the Shambles, are also places to visit. Take a trip down the river Ouse to see the sites. York also is a thriving shopping centre. 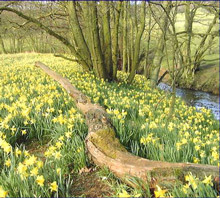 Dalby Forest, near Thornton Le Dale is a wonderful place for everyone, from its play areas, woodland walks, Bridestone Walk, Go Ape to it's cycle routes, cycle tracks and off road mountain biking. Cycle hire is also available. 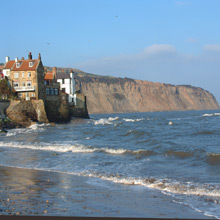 B&B accommodation, Self Catering, or a Guest House in the Pickering area is an ideal base to explore this fantastic area of Yorkshire and the Whitby coast line. Central to the North Yorkshire Moors everywhere including York can be reached within an hour. Accommodation in the moors is of a very high standard, with farm cottage accommodation and farm bed and breakfast accommodation offering fantastic facilities. Self catering offers the freedom to come and go as you will, while bed & breakfast offers the chance to taste a Deliciously Yorkshire Breakfast. Disabled facilities are available in cottages, while for those a little less mobile there is ground floor accommodation available, many attractions are fully accessible for disabled visitors. For those interested in farmers markets, they are ideally situated as we have the market towns of Pickering, Helmsley, Kirbymoorside, Malton and Thirsk (James Herriot Town) Fresh Yorkshire produce is everywhere for you to enjoy. There are plenty of things to do in North Yorkshire, from walking in the moors, fabulous drives and scenery, horse riding, beaches, cycling, steam railway, museums, castles, gardens and houses and after a busy day you can relax at a Farm House Self Catering Holiday, Guest House and B&B accommodation in and around The Yorkshire Moors. While you visit, sample Yorkshire food at its very best in local pubs & restaurants, such as the famous "Magpie" fish restaurant at Whitby. Alternatively market towns such as Pickering offer all sorts of dining from café's & pubs to Cantonese, Indian and Italian restaurants & takeaways. Cafes, cream teas, home baking, its all there! North Yorkshire can offer a whole wealth of experiences to the young; the old, the active or those just wanting to relax, admire the scenery & spoil themselves. The snug villages, country pubs and people, locations for All Creatures Great and Small, Last of the Summer Wine and Heartbeat familiar to millions worldwide, all make Yorkshire a place of contrasts and breathtaking beauty. From Rawcliffe House Farm our self catering & bed and breakfast guests are within easy reach of some of Yorkshire's many finest attractions which include Market towns of Pickering, Malton, Kirkbymoorside, Helmsley, Pocklington, Driffield and Beverley; pretty country villages of Thornton le Dale, Hutton le Hole, Ampleforth, Glaisdale, Egton, Appleton le Moors, Sinnington, Ayton, Levisham, Lealhom, Cropton: Stately homes and houses of Castle Howard, Duncombe Park, Hovingham Hall, Sledmere House, Fairfax House, Burton Constable Hall, Newby Hall, Sutton Park and Burton Agnes Hall; English Heritage Sites of Rievaulx Abbey, Byland Abbey, Pickering Castle, Scarborough Castle, Helmsley Castle, Clifford's Tower, Mount Grace Priory, Kirkham Priory, Wheeldale Roman Road, Whitby Abbey, Wharram Percy Deserted Medieval Village, York Cold War Bunker; National Trust properties of Nunnington Hall, Beningbrough Hall, Treasurer's House, Rievaulx Terrace and the Bridestones at Dalby Forest nr Thornton le dale; Seaside towns of Whitby, Sandsend, Ravenscar, Scarborough, Filey, Bridlington and Robins Hood Bay; bird watching at the RSPB nature reserve at Bempton and Flamborough Head; Cathedrals in Yorkshire, including York Minster, Beverley Minster and St Gregory's Minster; Gardens of Burton Agnes Hall, RHS Garden Harlow Carr, Helmsley Walled Garden, The Walled Garden at Scampston, Wytherstone Gardens, Jackson Wold Garden and Burnby Hall Gardens; Museums including Eden Camp, York National Railway Museum, Yorkshire Air Museum, Jorvick Museum, Ryedale Folk Museum, Beck Isle Museum, Malton Museum, York Castle Museum and Captain Cook Memorial Museum; North Yorkshire Moors National Park, including the North Yorkshire Moors Steam Railway running between Pickering & Goathland (better known as Aidensfield in the TV series of Heartbeat) and; Horse Racing at York, Thirsk, Ripon and Beverley Racecourses. Cycling and walking at Dalby Forest (Thornton le Dale): the Moors Centre at Danby.